of new products on a regular basis. Manufacture of silica is at the core of our business, producing the very latest surfaces to which we then add our innovative bonding chemistries. Full control of silica processes allows the ability to scale from UHPLC 1.7um particles upto 10um preparative scale particles. 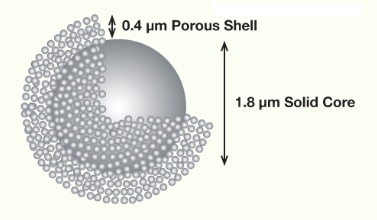 2.6um particles incorporate a 1.8um solid core, with a 0.4um outer porous shell. 5um particles incorporate a 4.0um solid core, with a 0.4um outer porous shell. Fortis PACE columns are an optimised design specifically for the needs of High Throughput Screening (HTS). Short columns lengths (20 or 30mm), high efficiency and resolution. Fortis PACE columns contain any stationary phase from the Fortis range and are specifically designed for HTS, whether isocratic or ballistic gradients. Optimised packing density in the low volume hardware leads to ultra sharp peak shapes combined with maximum efficiency. By combining a low volume flow path with an optimised frit Fortis PACE columns provide improved efficiency, asymmetry and pressure.